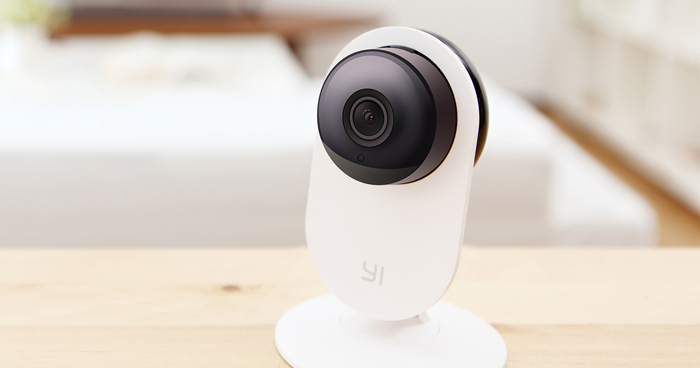 Xiaomi Xiaoyi smart camera support body feeling operation and code stream adaptive technology, whether a two-way voice calls with family, or captured children lovely photos, you can not missing any wonderful moment. Audio Input : Built-in mic. Compatible with : iOS 6.0 and above, iPhone, iPad, iPod touch, Android Device. 110-degree wide angle and 4x zoom. socket enables users to power on and off remotely, and it has a USB port. Xiaomi smart socket enables users to power on and off remotely, and it has a USB port. The ant smart cameras can be placed anywhere you need. You can get to know the situation where you want to know by phone or tablet at anytime or anywhere. If not at home, you can use the two-way voice calls. You can also participate in distant family birthday parties, capture the happy moment. Automatically start Smart security model when you leave home. You can view the situation on your phone, whether doors or windows are closed. Once something unusual or dangerous, it immediately begins recording and timely alarm to notify you when you are not in. You won’t miss every moment of the baby's growth. It can remote capture when your baby successful complete the blocks tower, or when you are overtime at night, you can croon a lullaby for him hum to sleep. Turn on the phone and get together with him immediately! Connect the power supply; Download Xiaomi smart home APP (also support the "small ant camera" or "xiaomi router" APP); Automatically connect. Playback at any time, edit your family videos In addition to real-time viewing, it can insert a Micro SD (TF) memory card to store video for look at any time. Recording automatically marked by the day, which is convenient for you to find or edit them. Perfectly fit for Xiaomi router, you can record video directly on the router 1TB hard drive. 1. 1280*720 HD resolution F2.0 aperture. 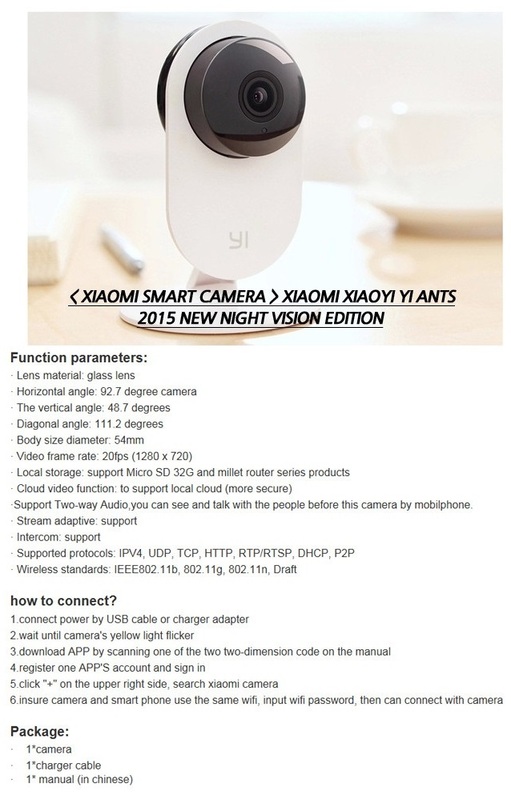 Small ants(XiaoYi)smart camera shows better optics permance to make pictures more transparent and delicate for using the all-glass lens instead of resin Lens that general used.even small details can be noticed and recorded by the HD resoulution 1280*720. You can get wonderful picture quality even in the low light cloudy owning for its F2.0 big aperture. 2. 111° wide angle with 4x digital zoom. Can realize 4x zoom,even details are viewed on the screen. You can identity whether there is an object moving in the picture by the motion detection technology,small ants camera only record when something move on the picture so as to help you save storage space.in addition,when out of home mode open,it will begin a record automatically once some suspicious moving in the picture and send information to your phone. You can identity whether there is an object moving in the picture by the motion detection technology,small ants camera only record when something move on the picture so as to help you save storage space.in addition,when out of home mode open,it will begin a record automatically once some suspicious moving in the picture and send information to your phone at the first time. In addition to real-time viewing ,it can also insert a Micro SD(TF)memory card,the storage of videos can be view back at any time, perfect adaptation with Xiaomi router, you can record video directly on the router’s 1TB hard drive. very safe in the local video storage,not only prevent the loss of privacy, but also avoid additional charges stored in the cloud service brings. 5. Playback at any time and any where convenient to edit your own family video. The content store in the small ants camera can be arranged according to the numbers of the day, easy for you to palyback or edit and then make it become your HD family record. 6. Supports stereoscopic operation, gyroscopes panoramic view.